History: On July 21, 1888, President Grover Cleveland signed a bill to purchase land to build an Army installation just south of Bellevue. On May 3, 1891, President Harrison signed an appropriation bill for construction and directed that the new fort be named after Major General George C. Crook. 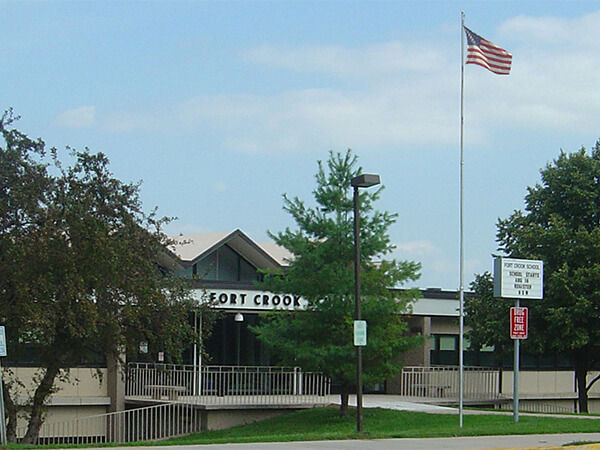 The first Fort Crook School opened in 1898, when the army located at Fort Crook and provided classes for the children of military personnel. After 63 years of service, the first Fort Crook School was sold. The Bellevue Public Schools kept the Fort Crook name alive when it opened Fort Crook Elementary School on federal land in 1963. School Purpose: To ensure that all students acquire the knowledge, critical thinking, and interpersonal skills necessary to be productive and contributing citizens.